Sketching random things you see or imagine and composing them into one sketch, can be a pretty interesting way to spice up your content. 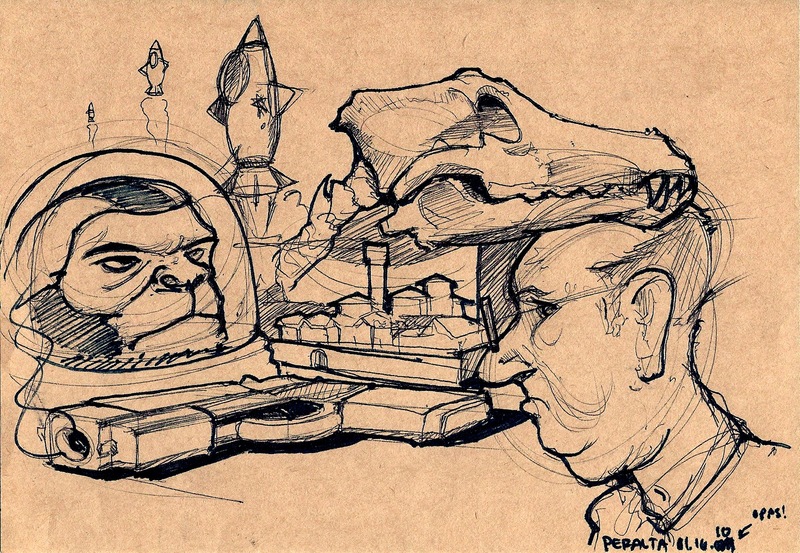 This is a combination of both things I came across, like the older gentleman on the right, the hand gun, and the city in the background…the skull, rocket ships and monkey in the space suit are from a Digital Art magazine. Had a bunch of fun with this sketch, hell…who doesn’t like drawing monkeys? One most important thing about sketching I remind people are they are your personal notes to something that may become refined later on. I think a lot of people are apprehensive when it comes to sketching because what they draw doesn’t look exactly what they saw or what they imagine. Bringing and idea to completion takes time. Even the great masters took the time to plan and figure out how to get to the final piece of their work. Sketching is a lot like note taking. You want to take as much as you can so you can go back to it for reference. 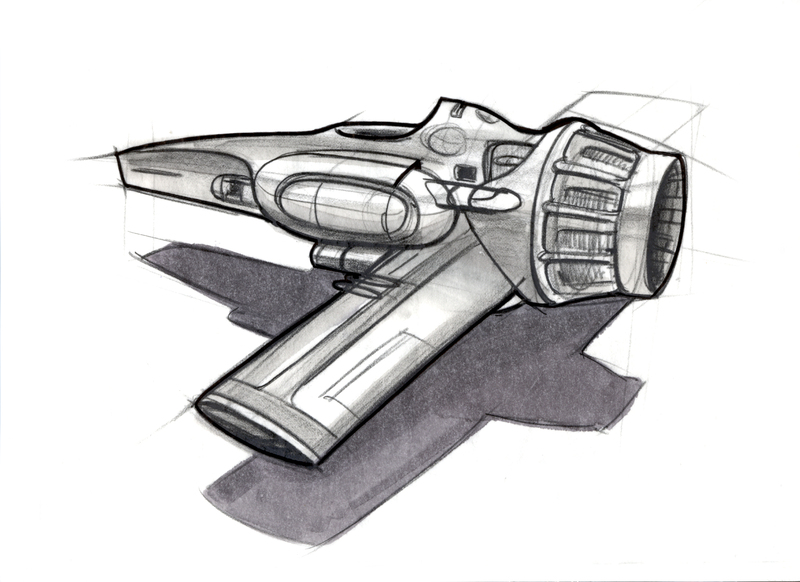 You’ll most likely do more sketches after that to refine you idea. 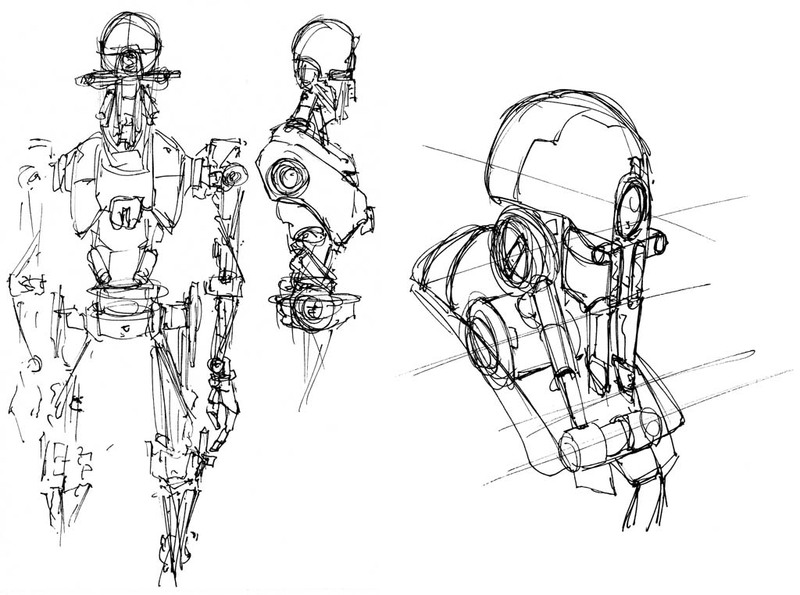 Below is a sketch of a droid I thought up quickly in my head. All the lines are merely suggestions of robotic and mechanical parts, nothing very specific, but just a quick and general idea. 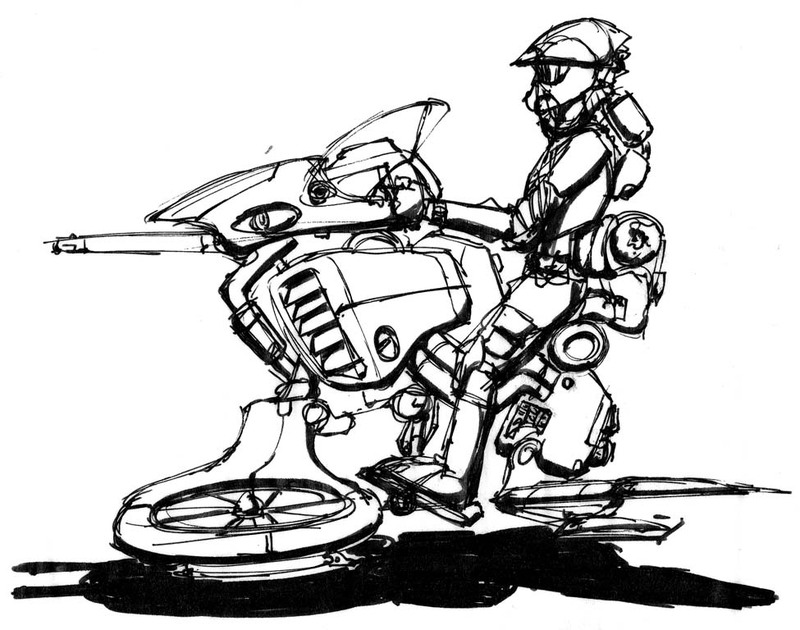 I can go back to this sketch to refine areas I want to later on to finalize the final idea of the droid. When sketching don’t draw the the details, make a suggestion of them, quick and fast. Here is a quick sketch I did while out and about, but wanted to share it with LW’s quickly…so, im testing out the iPhone’s ability to get a nice posting up on wordpress. 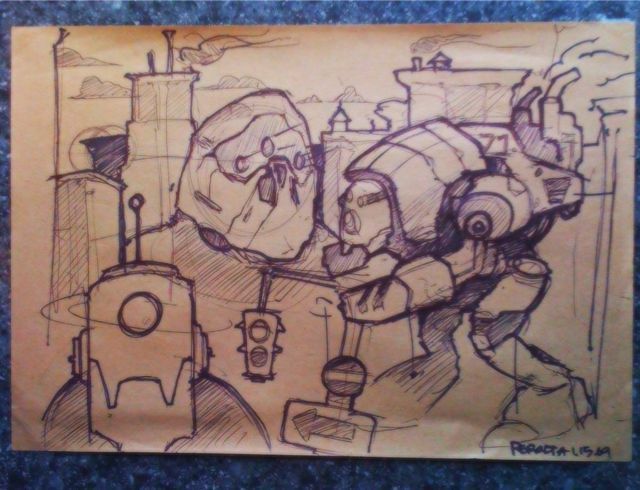 Sketched this on brown bag paper, took a photo, edited it with the Photoshop Mobile app and uploaded it with the WordPress app. I really want to explore the possibilities of sharing sketches/art/inspiration, quickly and at times when you dont have full computer access! Lets us know what you think… this concpet might become a regular on Lineweights! Enjoy! I have to admit that Tomasz Migurski really reinforced this idea when he saw my sketeches. Sometimes it is better to start from a side or front view of a drawing. It makes it easier on the brain and allows us to think about and break down the components of a design. Once we are comfortable with the design we can tackle it in perspective using the side and front views. Also try drawing with a really dark pen to boost your confidence in committing to your lines. This sketch was done with a fine pilot pen and Sharpies. I just got the Daniel Simon book and decided that I needed to threw this down in prisma, sharpie and chartpak on cheap trace. Lineweight? Lineweight! Thanks Daniel for great inspiration!